El-Nino or El Nino-Southern Oscillation (ENSO) is a spanish word which means boy. ENSO causes extreme weather (such as floods and droughts) in many regions of the world. It causes drought in India, Pakistan, Bangladesh and many countries of the world, while it causes wet conditions and floods in other part of the world. It has a deep effect on the Indian monsoon. 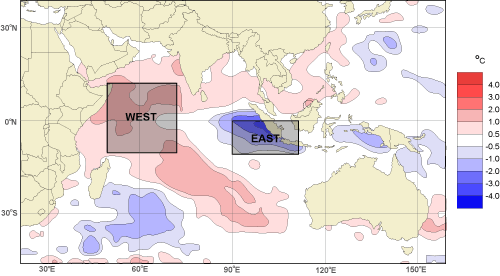 Negative Indian Ocean Dipole (IOD) causes cooler sea temperatures in western Indian Ocean with no rainfall in the Sub-continent while eastern Indian Ocean becomes warmer with heavy precipitation. In 1997, a positive IOD developed during the monsoon which usually means heavy rainfall for Indian Sub-continent but if you recall that year, Pakistan and North-Western India were going through a drought period. Karachi only had 19.4 mm rainfall during that monsoon compared to its average 145.6 mm rainfall. So why did drought occur in Pakistan with the presence of positive IOD? the answer is El-Nino. El-Nino pushed a high pressure over most of India including Pakistan that stopped the passage of monsoon rains. In 2009, IOD was in a neutral state meaning normal sea temperatures in the western and eastern half of the Indian Ocean but the El-Nino phenomenon caused 30% below normal monsoon rainfall in Pakistan and India that caused anxiety among the farmers of both the state especially India who depends 80% on these monsoon rainfall for their crops. But southern Pakistan that is Karachi and Hyderabad received above to very above normal monsoon rains than any other city of Pakistan during the monsoon of 2009. No one knows the reason, it might have been an isolated event. In 2010, La-Nina started gaining momentum in mid June and reached its peak in August. It caused heavy to extremely heavy rainfall all over Pakistan causing the great floods in Pakistan while isolated floods in India’s Kashmir. 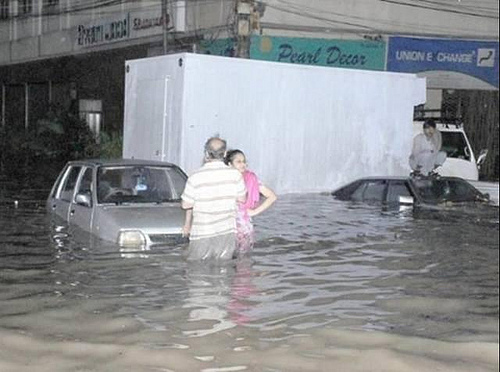 Karachi got 700 mm rainfall compared to its average of 145.7 mm rainfall during the monsoon. Normal monsoon has been forecasted by the Indian Meteorological Department (IMD) this year but since La-Nina is likely to die down this June or mid-July and a weak negative IOD is likely to form during the monsoon. So Sub-continent might get slightly below monsoon rainfall in some areas while slighty above in other. So lets wait for the monsoon! ← Weather Wars – Is it possible? Good article and information..shall I reproduce it on Vagaries ? Someone was asking about IOD on my blog.